United Tool & Machine supplies precision metal stampings for industrial, medical, firearm, fastener and other industries. From small and intricate to large scale, we specialize in producing quality, cost-efficient stamped metal components. 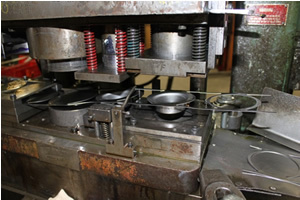 In-House die design and fabrication ensures process control. Jigs and fixtures are designed to assemble your parts while reducing lead times and improving quality. Capable of high volume production runs and cost efficient small-to-medium size runs, our equipment and expertise enables UTD to take on almost any job. Bed Size up to 24" x 36"